Blackberry rust on Evergreen flowers. Blackberry rust on Evergreen on both the top and bottom of the leaves. 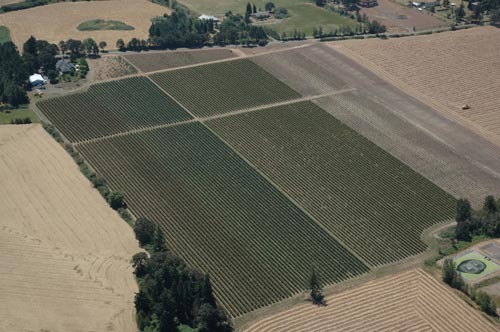 An Evergreen blackberry field on the left and a Marion blackberry field on the right. The left half of of the Evergreen field is severely infected with rust. A severely infected field of Evergreen blackberries. Plants at the end of the row are not as badly infected. Photo by Jay Pscheidt, 2005. Blackberry rust on Evergreen stems is rare even in severely infected fields. Blackberry rust on the lower surface of leaves of wild, fence row blackberries. Is is also shown on the flowers. Note the black telia as well as the orangeish uridinia. Blackberry rust on upper surface of leaves of wild, fence row blackberries. Blackberry rust on wild Himalaya blackberries found along a fence near cultivated blackberries. Cause Phragmidium violaceum, a macrocyclic, autoecious (can complete their life cycle on this one host) rust fungus that is a problem on cultivated Evergreen and wild Himalayan blackberries. 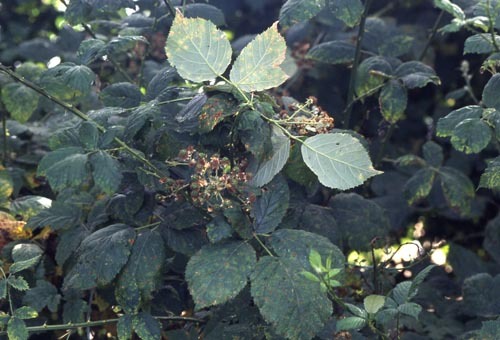 Although other cultivars of blackberry can be infected, none appear as susceptible as evergreen blackberry, which can result in significant crop loss. 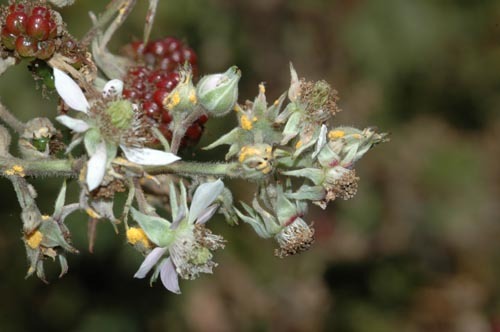 Among wild Himalayan blackberries there appears to be a range of sensitivity with some clones highly susceptible while other nearby plants seem unaffected. Rubus armeniacus is one of the most common invasive species in western areas but unfortunately is not highly susceptible to this rust. 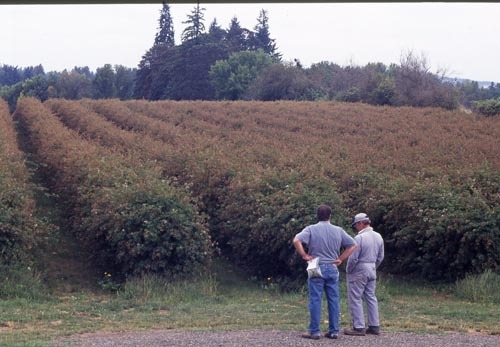 Although the disease was first recorded in 2005, growers and ranchers of western Oregon observed this problem in 2004. The rust has been found in all West Coast States. In British Columbia the disease has not been observed in the full range of its host. As of 2008, the rust was found in localized infections on coastal east central Vancouver Island and on the southwest lower mainland. The fungus overwinters as telia principally on leaves that remain attached to canes and/or those trapped in cane bundles. Teliospores germinate in the spring and produce basidiospores that can infect leaves of primocanes and floricanes. These primary infections produce aecia, which produce aeciospores, which also infect leaves. These infections produce uredinia, which produce urediniospores that infect the flower buds and leaves and stems of the primocanes and floricanes. New uredinia are produced from these infections and continue the epidemic, building up disease in rapid, successive cycles. Black pustules (telia) develop among the uredinia in the late summer/early fall on infected leaves. Old floral canes can be a significant source of spores for fall infection of primocanes in the Pacific Northwest. Wet conditions (> 6 hours of leaf wetness) with mean daily temperatures between 49°F and 64°F favor disease development. Spores are easily spread by the wind; young leaves at three-quarters expansion are most susceptible to infection. 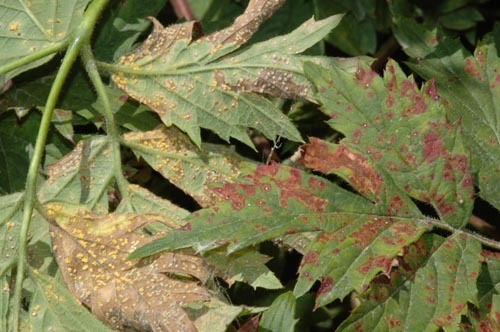 Symptoms Foliar symptoms include circular purplish leaf spots with yellow to tan centers on the upper leaf surface accompanied by cream to yellowish-orange pustules (aecia and uredinia) on the lower leaf surface. The upper leaf symptoms may resemble Septoria leaf spot while the lower leaf symptoms may resemble cane and leaf rust. 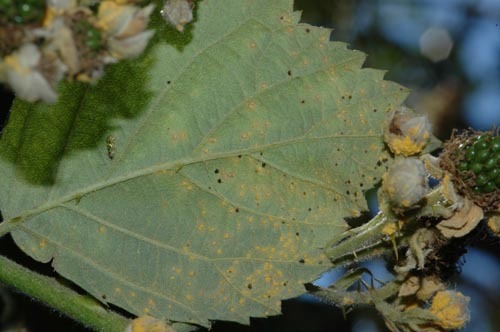 Yellowish-orange pustules may also form on the flower buds, fruit and canes of infected plants. 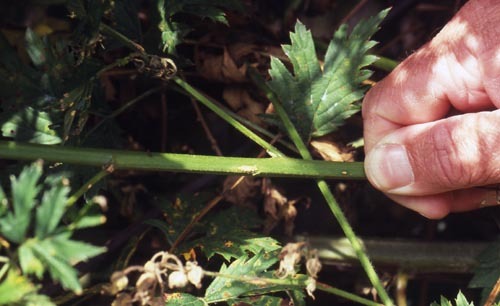 Cane infections on evergreen blackberries are rare even when leaf infection is severe. Severely infected leaves may curl and dehydrate. Severely infected flowers and fruit fail to ripen. Continuous defoliation as well as stem infections by the pathogen may cause dieback of the canes. Black pustules (telia) develop among the uredinia in the late summer/early fall on infected leaves. Cultural control Cultural tactics and dormant season lime sulfur will help reduce initial inoculum sources while chemical tactics will focus on protection of young, healthy plant tissues. Field renovation practices that destroy previously diseased plant parts may contribute to the effectiveness of a chemical control program the following spring. Remove old fruiting canes right after harvest. If removal cannot be scheduled right after harvest then cut old floral canes as early as possible to prevent development of more spores. Remove and burn old fruiting canes as soon after harvest as possible, cutting flush with the ground. Cultivate as soon as weather permits. Strip leaves from primocanes before tying. In home gardens, destroy fallen leaves and other refuse. Chemical control Chemical protection needs to start with applications of lime sulfur targeted to infected leaves remaining on canes or trapped in cane bundles. The rust reactivates in fall, and consequently, a fungicide application near mid-September may be beneficial to plant health. Overuse of any single product may encourage the development of fungal resistance. All of these fungicides are primarily protectants and cannot eradicate the disease after it has become established. Apply delayed-dormant lime sulfur spray to trellised canes. Wait until the first buds produce about 0.75 inches of new growth (this is typically in late March to early April). Sulforix at 3 gal/100 gal water. 48-hr reentry. Apply to both fruiting and primocanes in the spring about 4 weeks after the delayed dormant spray. Spray again if the rust becomes active during the growing season. Alternate fungicide materials from different chemical groups. Research indicates that Rally (Group 3 fungicide) is better than Group 11 fungicides. Rally 40 WSP at 5 oz/A. Do not apply within 5 days of harvest. Group 3 fungicide. Oregon only. SLN OR-080002. 24-hr reentry. Note Some registered products offer only suppression of this disease and thus are not recommended for use. These products include Cabrio and Pristine. References Callan, B.E., Wall, R., Dale, P., and Joshi, V. 2011. Phragmidium violaceum on Rubus armeniacus and R. laciniatus in British Columbia. North American Fungi 6(14): 1-5. Johnson, K.B., and Mahaffee, W.F. 2010. 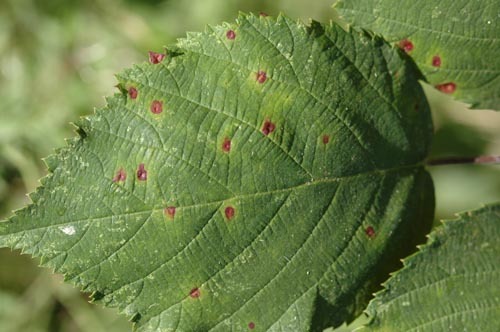 Factors influencing epidemiology and management of blackberry rust in cultivated Rubus laciniatus. Plant Dis. 94:581-588.